Information on how to get a Shenzhen Visa can be hard to come by, with everyone from your travel agent to the Chinese Embassy giving conflicting advice. We have put together what we believe to be the most concrete information on the Shenzhen visa situation. In coordination with the Chinese Foreign Ministry in Hong Kong and travellers real life experiences, the information here will be as up to date and accurate as you will find on the web. If your experience is different from the advice below, please contribute at the end of the article or, alternatively, add your own question. Who Is Eligible For A Shenzhen Visa? Most nationalities are eligible for a Shenzhen Visa, but there are notable exceptions, including the US and, depending on the year, the UK. You can only get a Shenzhen Visa at the Shenzhen border with Hong Kong. You can expect queues on certain days. How Long Is a Shenzhen Visa Valid For? Shenzhen visas are valid for five days. You absolutely must leave Shenzhen before the five days are up. This type of visa cannot be extended and if you overstay the visa, you will find yourself face to face with China’s Public Security Bureau and facing a hefty fine. You do not have to return to Hong Kong at the end of the visa, but you cannot travel further into China unless you have a valid Chinese Visa. Where Can I Go With a Shenzhen Visa. 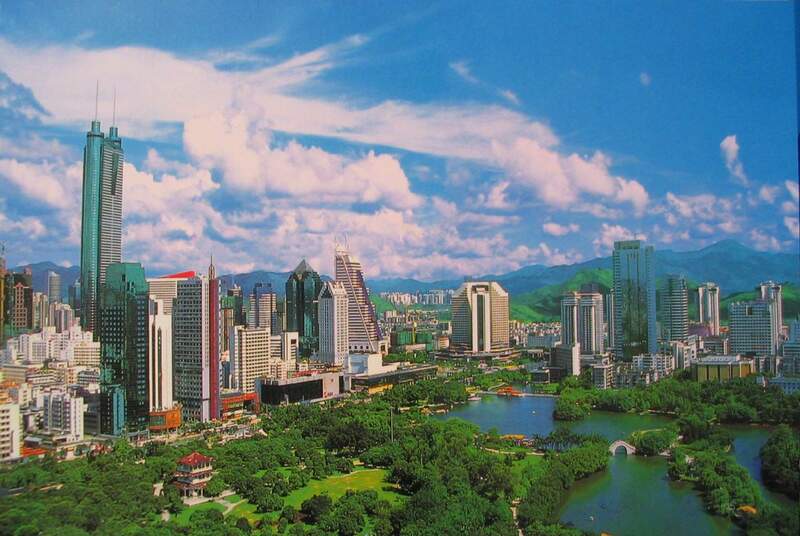 Shenzhen visas are valid for the Shenzhen Special Economic Zone, including Shenzhen City, Shekou and most of the factories in the surrounding countryside. Guangzhou is not included in the Shenzhen Visa. While you won’t be checked leaving the Shenzhen SEZ, you need a visa to check in hotels in China, and if you’re caught by police outside the Shenzhen SEZ, you may face serious trouble. Alternatively, you may apply for the Guangdong Group Visa (restrictions apply), or you'll need a full Chinese Visa. How Much Do Shenzhen Visas Cost? Like prices for a Chinese Visa, prices depend on your nationality; however the standard price is HK$150, and applies to most European passport holders, Canadians and Australians. Prices for UK citizens are substantially higher. You may only pay in Chinese Yuan. Can I Buy A Shenzhen Visa In Advance? No, Shenzhen Visas cannot be purchased from Chinese Embassy’s or the Chinese Foreign Ministry in Hong Kong. They can only be bought at the Lo Wu border crossing. How Many Times Can I Travel Between Hong Kong and Shenzhen on a Shenzhen Visa? Shenzhen Visas are only valid for a single entry. There is no limit on how many Shenzhen visas you can obtain, although, if you want to visit Shenzhen a number of times, you'd be better investing in a multiple entry Chinese Visa. Situated in a coastal plain of the east bank of Pearl River Estuary with geographical coordinates at 113.49’east longitude and 22.36’north latitude,Shenzhen Baoan International Airport is 32km from Shenzhen city proper, enjoys a vast expanse of field and good clearance condition for the movements of large passenger and cargo airplanes and meets the operation standard of international large-scale airport. Shenzhen Baoan International Airport provides operation service of 24 hours. Shenzhen Baoan International Airport is the first modern international airport realizing the combined transportation by sea, land and air, and adopting transit transportation in the territory of China. In terms of ground transportation, Guang-Shen Expressway, Jihe Expressway and national highway 107 connects Hong Kong, Macao, Guangzhou, Dongguan, Huizhou, Zhongshan and Zhuhai. The airport possesses passenger and cargo transportation terminal of 1000-ton grade berth. In terms of marine transportation, Hong Kong, Macao and Zhuhai are connected by hovercraft. In terms of air transportation, Hong Kong and Macao are connected by helicopter, enjoying favorable conditions of collecting and dispatching. Aircraft between Hong Kong and the rest of the world can move in the most convenient mode to conduct passenger and cargo transportation. The Airport adopts usual international practice for the passenger and cargo transportation to provide most fast and convenient service in the territory of China. Supported by the Pearl River Delta, one of three central belts with most rapid development of economy in China, Shenzhen Baoan International Airport enjoys rich passenger and cargo resources as well as the first class hardware and software, so it is a good choice for any airlines to fly to China. Shenzhen Baoan International Airport covers a land area of 11 km2, is planned and designed according to the standard for the first grade civil airport of the People’s Republic of China, constructed by installations, with the construction investment of RMB 980 million for the phase 1 and 900 million for the phase 2. The flying area is of 4E grade. The Airport provides 24-hour service, and possesses 1 runway （3400mх45m）and 1 taxiway for the movement of the largest passenger and cargo airplane in the world. Now it has a total area of 588,000 m2 of apron, 57 gate positions, with 24 corridor gate positions, a total area of 146,000m2 of airport lounge A and B to meet the requirements of 16 million person-time annually, 2000 parking spaces, aviation cargo terminal with annual handling capacity of 0.3 million tons as well as the terminal with most passengers leaving and entering Guangdong province. Open to air traffic on October 12, 1991, Shenzhen Baoan International Airport enjoys fast growing aviation business since its putting into use. It was developed into international airport officially on May 16, 1993 and jumped to the fourth largest airport in China within as short as five years in 1996. It handled the passengers of more than ten million person-times in 2003 to be ranked among top hundred airports in the world. Shenzhen Airport completed the reconstruction and expansion of airport lounge B in January 2004. After a great deal of preparatory work in the prophase, the expansion of flying zone of Shenzhen Airport started officially in December 2005. It is planned to put the second runway and new terminal area into use in 2011. Shenzhen Baoan International Airport is one of four aviation cargo transportation centers of China planned by the Civil Aviation Administration of China, possesses international traffic rights of 37 countries and is used by over 20 domestic and foreign airlines. Now Shenzhen Baoan International Airport has opened over 120 domestic and international routes, reaching over 90 domestic and foreign cities (of which cities outside the territory of Chinese mainland include Macao, Singapore, Seoul, Kuala Lumpur, Anchorage, Chicago, Liège, Osaka, Tokyo, Bangkok, Dubai, Penang, Amsterdam and so on), besides, the scheduled flight at sea between Shenzhen Airport and Hong Kong Airport was open to navigation in September 2003 to realize the transfer of passengers. Shenzhen Airport Aviation Logistics Park is one of four logistics parks planned and constructed in Shenzhen and put into operation in July 2004, which will help Shenzhen Airport to handle cargos of 700,000 tons/year. Shenzhen Airport Company was founded in May 1989, fulfilled group transformation in May 1994, and incorporated listing company in April 1998. The stock of “Shenzhen Airport” was listed in Shenzhen Stock Exchange on April 20, 1998. As the enterprise directly under the National Assets Committee of Shenzhen and holding company of Shenzhen Airport Stock Company, Shenzhen City Airport (Group) Co., Ltd. had total assets of RMB 7.35 billion, net assets of RMB 4.87 billion, state-owed net assets of RMB 3.36 billion and ratio of debts to assets of 33.7% till the end of 2006. It is expected to fulfill the passenger handling capacity of 18.2 million person-time, cargo & mail handling capacity of 550,000 tons, the movement of aircrafts of 167,000 sorties, and rank the fourth place nationwide. With “safety first” as the guidance and clients’ satisfaction as the final check standard, Shenzhen Baoan International Airport keeps improving safety assurance level and service quality to provide clients with high quality service. Take the lead in developing a batch of boutique service programs including “unaccompanied minors”, “present settlement of claim on damaged luggage entering the port”, “providing lock room” and “warm check-in”, practice social commitment system, and provide automatic check-in service to meet the requirements of a wide range of clients on service. In 1998, it was among the first to win the honorable title of nationwide “friendly airport" granted by the Civil Aviation Administration; in May 2000, won the title of the first “international health airport” of Asia granted by WHO and listed into the new record of the 8th batch of national enterprises of China Enterprise Association; in 2000 and 2001, won the first place nationwide in the program of “civil aviation in my eyes” for two successive years; in September 2001, Shenzhen Airport held the comprehensive exercise on the aviation emergency rescue successfully, which is a solid and comprehensive rescue drilling and participated by navy, land and air army, and enjoys unprecedented scale in domestic civil aviation history, and was listed into the new record of the 7th batch of national enterprises of China Enterprise Association; in 2001, cost management fruit of the group obtained the second prize of national management modernization and innovation fruit; in 2002, ranked among top 500 enterprises nationwide; in 2003, obtained the award of merit of national “blue sky rejuvenation program” and ranked among top 100 enterprises of Guangdong province; in 2004, honorably obtained the high quality award to the satisfaction of clients of airport with handling capacity of ten million passengers in the program of “civil aviation in my eyes”; in 2006, obtained the “concerted cooperation award” of “simplified business” program of international aviation transportation association. In October 2006, “Middle and Long-team Development Strategy and Plan of Shenzhen Airport” was reviewed and approved by experts. Such strategies were included in the “Plan” as "taking the construction and operation of airport, the safeguard of the ground of aviation passenger and cargo transportation, supplementary service and operation management as the main to create international first-class management, upgrade the network value of airport, realize the coordinated development of economic benefits and social benefits”, which is the guidance document for the development of airport in the future.